It has been classified for 30 years, but now they got to meet A nice story. Nice story but the SR-71 was in International Airspace and then Swedish airspace (according to the story) so why would Russian MIGs bother the SR-71? Or was it not mentioned that the SR-71 "strayed" into Russian airspace? So the SR-71 spyplane came back after violating russian airspace, developped an engine issue and a few Flagons interceptors were closing in, locking the Blackbird? And then the Viggens surrounded it preventing the russian from making the kill? If for no other reason, if you were a Russian fighter pilot having gun camera film, without actually firing, you would be Number One Pilot in the PVO-Strany. I mean Order of Lenin material. They tried and tried unsuccessfully to nail an SR. If for no other reason, if you were a Russian fighter pilot having gun camera film, without actually firing, you would be Number One Pilot in the PVO-Strany. I mean Order of Lenin material. They tried and tried unsuccessfully to nail an SR, in international airspace. There was no such thing as Russian airspace back then, just Soviet. There seems to be no mention of the SR-71 violating Soviet airspace. I have trouble understanding what they did. An engine trouble developed on aircraft A in international space, then aircraft B, C, and D came to look. Aircraft A continued on its way. At no time did a potentially hostile aircraft E appear. Is the point that B, C, and D helped keep E away from even trying to close in? Or something else? Admitting you ecaped Sovjet airspace, fleeing into international airspace after engine trouble, with defense fighters on your tail is saying you broke international law. Which can't be the case. It' all miscommunication and fake aquisitions, the others did it too, etc, see.. The evil russian fighters were very aggresive above international waters and the Swedes got a medal for just being there..
"the Soviet Union had spotted their jet and had sent several fighter aircraft in pursuit. "They had orders to shoot us down or force us to land," Veltri said. At around 3.15pm, Veltri looked out of his window and saw two little dots approaching quickly. "We immediately thought that they were Soviet planes. But when they came closer we saw that there were two Swedish Viggens. Blad and Ignell escorted the Blackbird in international airspace into Danish airspace where Danish fighter aircraft then took over. The Americans Noll and Veltri eventually landed safely at an American base in West Germany. They tried and tried unsuccessfully to nail an SR. I do recall a statement from some USAF officer that the only thing keeping the Vietnamese from shooting one down was their lack of C4I, I.e. putting their SAMs up in the air far enough ahead of it. Probably am old aeroplane magazine, would need to see if I can find it. But an amazing piece of technology it was and pretty much still is by today's standards. *any idea if an F15 ever got one during a test? I guess not only the pilots, you want to avoid another Gary Powers show. Official information aired in that era always has to be looked at through cold war glasses. That's even the case now, if the wrong guys have success it's always a "technical malfunction" or "unkown" "unconfirmed" at least. down. W'll never know about 60-6932. I know early F-15 guys who tried being set up on a head on a GCI intercept. As soon as the SR-71 turned, even at M 3.0 the radar solution went away as the range and angles opened up. It had to perfect with no defensive action by the SR. Getting a camera shot would have been enough unless ordered to fire by the PVO HQ. I suspect tha SAM-2 would have had to be set up perfectly too. At cruise level, the SR-71 would have been at the very end of the Guideline’s altitude capability, but far faster than the -2 was designed to hit. The search radars had very short time between acquisition of the inbound SR, transfer to the launch site and fire control acquisition. A pretty tight time line at M 3.0 for the computer technology of the day. OEI is another story, a dead duck. The replacement platform(s) for the A-12 did a great job making interceptors/SAMs negligible. A SR-71 with an engine out, at FL-250 is really just a sitting duck. The fact the AJ-37s intercepted it confirms that. USSR Su-15s were 'on the way to intercept' the SR. The Soviets were probably flying the Su-15T/TM versions, which had an advanced radar. But once the Viggens were escorting the Blackbird, the Russian targeting would have been more complicated. There would be no way to assure a kill on the SR-71 without killing one or all of the JA-37s, too. To assure a kill on the Blackbird and Viggens they would need two Su-15TMs armed with 4 AA-3s or 2 AA-8s, each. Since the AA-8 (max range about 5 nm) and the AA-3 (max range about 14 nm) were short ranged missiles, the Flagons would have had to close to less than 10 nm for the AA-3 or about 3 nm for the AA-8, or less than 1 nm for a 23mm gun kill. Then the USSR would have been accused of shooting down aircraft from two nations in international airspace, but that never really mattered to the Soviets. Getting a kill on an SR-71 would have been a big feather in some Soviet Officer's hat would have been worth it to them, even if it was a cheap kill on a disabled aircraft. Killing the Swedes would have meant nothing to them. grossly and intentionally the Soviet airspace which would also have been an act of war. Had some pilot shot a SR-71 just to show his ability would have earned something else than a feather in the head. The story does not tell from where the SR-71 was returning from. The Baltic Express route flown regularly was over international waters and there has been no stories that the US would have flown such espionage flights over the Soviet Union in the 80's, when satellites did exist. Hence I suspect that this was not a big thing. Other links (https://theaviationist.com/2018/11/29/t ... -airspace/) hint that it was rather to help a damaged aircraft to find home and follow it in case it would crash in the sea to help a potential rescue, and of course to get a feather in their hat as "intercepting" the rare bird. The SR-71 was made for violating USSR airspace & getting away with it. So that was probably exactly what it did previous to flying into international airspace. If you believe it was there for doing patrols over international waters, google around. The SR-71 was made for violating USSR airspace & getting away with it. yes, than a) Gary Powers was shot down and b) early testing showed that the intended "too quick for a target lock" didn´t really work. Had some pilot shot a SR-71 just to show his ability would have earned something else than a feather in the head. There is more than one way to take down an aircraft without shooting it down, remember the P-3 incident near China? You just need to fly some dangerous maneuver around or in front of a wounded SR-71 and you may have a good chance of taking it down without firing a shot. There is no such thing as international law, and no international law enforcement body. There are accords, agreements, treaties, and accepted norms, but no international law enforcement body. 1. The U-2 incident was in 1960...SR-71 didn't come around til later in the decade. I agree, the SR-71 did not go over Soviet airspace, quite apart from the ramifications of doing so, certainly by this time it would have had equipment with some stand off capability, along with of course those spysats. It wasn't only USAF aircraft that met the Royal Swedish Air Force on the Baltic Express, pics exist of a RAF Nimrod R.1 being escorted by IIRC J-35's, you can bet USAF RC-135's too, probably those German modified ELINT Atantique's, the Baltic being their patch too. The SR-71 in this incident was almost certainly on an ELINT mission too. As to the question of post Gary Powers and the SR-71, the USSR could not assume the B-70 was buried, they probably thought if Goldwater or someone similar had become President, the production program might be restarted. (As happened later, when the cancelled B-1 was later brought back albeit in modified form). Plus you can argue that the USSR, being aware of a program to replace the U-2, (even before Powers was shot down), would develop the Mig-25 to deter that, if nothing else. Just because you can do something doesn't mean you should. By the '80's the Keyhole satellites were returning detailed enough pictures that there was no point in risking it and poking the bear (figuratively and literally) unless you absolutely needed to. Besides the fact that something could go wrong with the SR-71 over Soviet territory (such as the malfunction above), the Soviets could have developed capabilities that the US wasn't aware of, which is exactly how Powers got shot down. Why risk the political fallout and the possibility of turning over parts of a SR-71 unless there was something that justified the risk? I'm not saying that overflights were stopped completely, just that they weren't that frequent and the decision to do so was a serious one that went far up the chain of command before it was approved. And to Thomas' comment, the SR-71 was never about "too quick to lock", it was about out-running the missile. There's a practical limit to how fast missiles can go. Delta-v requires fuel, a lot of fuel and it also imparts stress on the missile itself... which requires more rugged components which add weight which requires more thrust. As you add weight you also impinge on the missiles ability to maneuver without rapid unplanned disassembly. Without a break-through in materials you can pretty accurately define the performance range available. Last edited by sandbender on Mon Dec 03, 2018 8:50 pm, edited 1 time in total. What if there was a follow on platform that was able to achieve even greater altitudes and higher speeds? So much so that the USSR couldn't ever touch it? Perhaps but if there was superior platform available towards the end of the Cold War, I think we would have heard about it by now. It's possible it could have been kept a secret but I don't see how given the nature of the missions and the level of support it would have required. By definition it would either have to overfly or stage from other countries (friendly or impartial), at some point a break down would have required landing at a friendly base. There's no way that many people could have kept their mouths shut. So, possible but unlikely. But even then it supposes that the Soviets couldn't have matched it which is a dangerous assumption. Soviet aerospace was limited by infrastructure and finances, not ingenuity or intellect. They also had to work under practical conditions. Logistically, I don't think the Soviet Air Force could have supported the SR-71 and the condition of the fields and the support crews available were something that had to be taken into account. The Soviet military was largely a conscription army. Experienced lifers were rare and generally tasked with making sure the conscripts didn't completely screw things up, by the time the conscripts were trained up they cycled out. Any country that can turn out the MIG-29 under the conditions Soviet aerospace was facing should not be taken lightly, they were more than capable of pulling together some nasty surprises despite everything. That is nice; has no bearing on what I typed nor refutes anything but nice for your bandwidth I guess? Did you actually have something to say with regards to the incident at hand? Or the authoritative agency? I suspect not since it does not exist. Every SR-71 pilot and commander including the Wing Commander at Beale AFB during the 80s that has given interviews and answered the question if they flew over Soviet Union airspace or Chinese mainland airspace will say no it was never authorized or tasked. The main reason is that no president since Eisenhower was willing to risk the embarrassment of a Gary Power's type fiasco. On another note, an A-12 suffered shrapnel holes in it's skin after flying over North Vietnam in 1967. The pilot saw the 3 SA-2 detonations behind his aircraft and they determined it was most likely one of those SAMs. It was close to being the only Blackbird lost in combat. The one has nothing to do with the other. The initial request to Skunk Works was made late in 1957. The CIA approved the contract for the first dozen A-12s 11-Feb-1960, a few months before Powers was shot down. The first A-12 flew 25-Apr-1962, the first SR-71 flew 22-Dec-1964. What a naive post or maybe you're trying to be a goody two shoes but we used to track the SR71's that were trying to spy on us, here in South Africa. There are interesting stories from the SAAF guys who monitored them, like drawing arrows on the ground, showing them where to exit our airspace, so yes I believe they would have done the same to the USSR and other countries, I mean why go to all that expence to develop the asset and then not use it to it's full potential. It was developed because of the Powers incident after all. Not to malign the sovereignty of South Africa but at the time there was a world of difference between an overflight of the USSR and an overflight of South Africa. One act could start a full scale nuclear war, the other a diplomatic row. It doesn't mean it was right but the risks associated were both were not equivalent. An excellent chapter from the revised edition of Paul Crickmore's "Lockheed Blackbird: Beyond the Secret Missions". I believe that chapter (Chapter 13: Squaring up over the Barents Sea) was one of the sections added to the revised edition. In fact, the whole book is probably the best book available on the Blackbird with a huge amount of detail and great photographs throughout. The chapter on the MiG-25 and MiG-31 gives all that additional information on how the other side responded to it, and it does give a good counter-balance to the long-held belief that the SR-71 was invulnerable. IMO, the OP article is probably incomplete or inaccurate. At face value it is hard to see what the Viggen pilots actually did. There is not even any reference to the SR71 being in danger. My hunch is that either the SR71 was in Soviet airspace at some point, or that they were pursued into International airspace by Soviet fighters. From the article, nothing really interesting happened in the frame of the Cold War. The fact that this whole story is unveiled now is surely related to the current political situation. With a Sweden taken between a NATO looking for expansion against the "Russian threat". "Hey, Sweden, just look at how we were close friends back in the day." When this was published (2004) comunication with russian former militairy / test pilots / research people was open, nice, interesting. Now we are back in a good / bad, us / them era. And factual information gets killed by ideological agenda's. 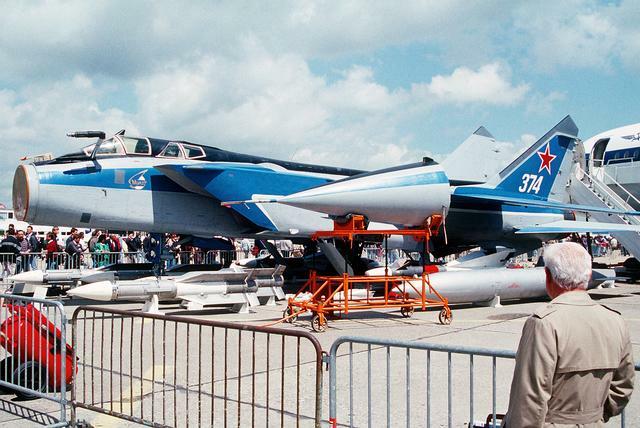 I remember in 1991 the russians came to Le Bourget, to show off what was under the hood of the MIG31 (a huge phased array radar).